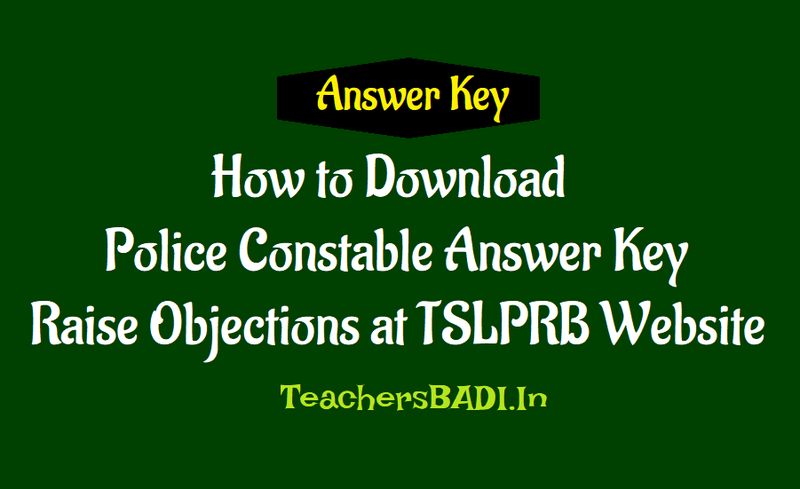 How to download Constable Answer key and Raise Objections at TSLPRB Website. TSLPRB Keys 2018 for the TS Police Constable PWT Examination conducted on September 30 has been released on tslprb.in. Check instructions and answer key on the link provided here. Telangana State Level Police Recruitment Board, TSLPRB has released the answer keys for the Police Constable Preliminary Written Test, PWT examination conducted on September 30. The TS Police Constable Answer Key 2018 is now available on the official website. Direct link to TSLPRB Key 2018 is provided below. The instructions to raise objections are provided below. Candidates to please note that the answer keys were released on tslprb.in. The candidates who have appeared for the TS Police Constable PWT 2018 on September 30, 2018 are required to go through the same. In case of any objections to the answer keys, the candidates can raise the same online on the official website login window. Last date to submit objections is October 8, 2018 till 5 pm. Step 2: On the home page, click on the PWT Answer Key 2018 link activated under SCT PC Civil/ or Equivalent. Check the TSLPRB Key 2018 on link provided here. Step 1: Click on Login on the home page to go to your account. Step 2: The web template to raise objections is provided in your individual accounts. Step 4: Select the Question Paper Booklet Code, Question Number, Choice given in PWT Answer Key, Answer Suggested by Candidates (yourself) and enter the explanation. Step 5: Candidates are required to upload supporting documents in pdf / jpeg format as attachments. Please note that for each question, candidates are required to fill the separate form. Also, objection without sufficient information would be rejected. Candidates are advised to carefully go through the instructions provided in the account as well and scan the documents they wish to attach. The window to raise objections would be open only till 5 pm on October 8, 2018.